Il barone rampante tells the adventures of a boy who climbs up a tree to spend the rest of his life inhabiting an arboreal kingdom. Small wonder May Cherief has to think of this no vel by Italo Calvino while watching the tree climbers fast ascend up a 40 m tall ash trees, swaying in the wind. 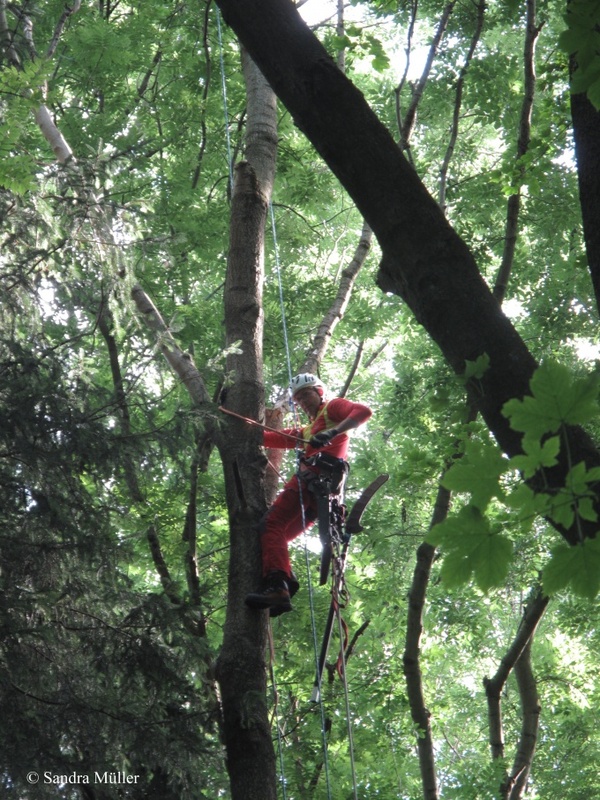 While the climbers adjust their short safety lines and ascend still further into the crowns of the tree to reach for the sunlight part of the crown, Virginie Guyot and May Cherief start to collect spiders from the shorter trees in the understorey. Virginie is a PhD-student from INRA, Bordeaux. 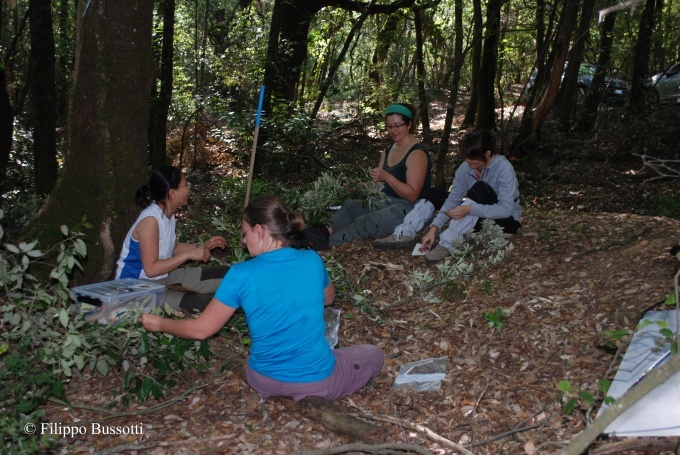 Within FunDivEUROPE she will study the effect of tree diversity on resistance of trees to herbivores. Preliminary results from the Experimental Platform and the Baccara project suggest that the relationship between biodiversity and herbivore attacks is not as straight forward as commonly believed. The common believe that insect herbivory will decrease with increasing biodiversity could be confirmed for insects specialised on a specific species but not for generalists. 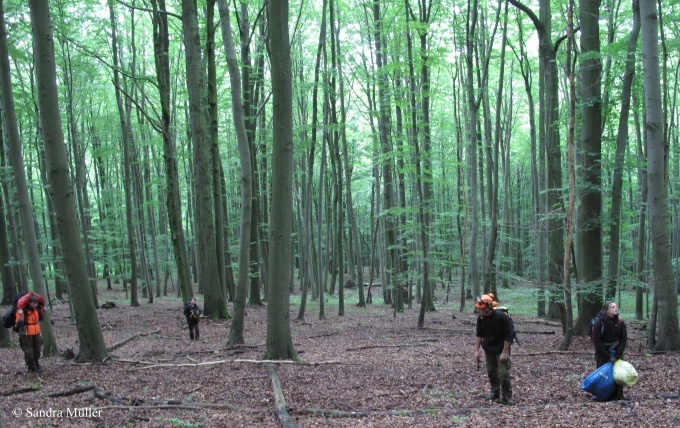 By collecting arthropods along the diversity gradient of the Exploratory Platform, Virginie extents her studies from herbivores to their predators. “Watch out! Top branch down!” the first climber cuts a branch, and now we go and separate the leaves for the different research teams. Diem Nguyen (SLU) and Virginie Guyot need leaves for herbivore and pathogen assessment. An additional sample for Diem will go straight to the drying oven, as they will be needed for DNA analysis of pathogens. Charlotte Grossiord (INRA, Nancy) will use the leaves for isotope analysis of δ13C and δ18O, these provide time-integrated information on transpiration and water use efficiency. A week prior to this campaign she and other members of task 3.9 were installing sap-flow sensors within the highly instrumented plots (HIPs) for direct measures of transpiration (xylem flow) and predawn leaf water potential. Nitrogen content of the leaves will also be determined for assessing nitrogen resorption efficiency by senescent leaves (task 3.6). The senescent leaves will be collected with litter traps during leaf fall. Martina Pollastrini (UFI) and Vera Holland (GUF) place their leaves in black plastic bags. They need to be dark adapted for the measurement of photosynthetic acclimation with fluorescence of chlorophyll (JIP-test). Their research aim is to explore the possibility to use fluorescence as predictor of biomass productivity and resilience of the ecosystem. While we take the leaves from the cut down branch and sort them to different bags, more and more branches start coming down from the trees. About two hours later tree climbers have been to 9 different trees in this three species mixture. Then it is time to come down from the tops, pack and walk to the next plot. In some case this means walking half an hour through the forest with 50 kg on your back. Life is so much nicer when you´re the baron in the trees. T.3.9 Water balance and water use efficiency on different scales: Arthur Gessler (ALU-FR,), André Granier (INRA, Nancy) Damien Bonal (INRA, Nancy), Charlotte Grossiord (INRA, Nancy). T.4.6 Resistance to Fungal Pathogens: Helge Bruelheide (MLU), Jan Stenlid (SLU), Diem Nguyen (SLU). The team is currently in Finland and will return home afterwards. The Exploratory Regions of Spain, Romania and Poland will be visited next year. FunDivEUROPE factsheet 01/2011 is available in English, German, Polish, Spanish, Italian and Finish. Get the latest version on the Factsheet-Download-Page!